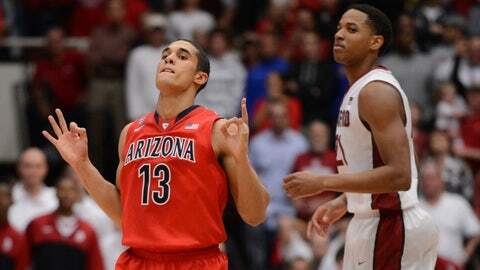 Wildcats guard Nick Johnson celebrates his late 3-pointer against Stanford on Wednesday at Maples Pavilion. Arizona defeated the Cardinal 60-57. STANFORD, Calif. — For nearly 9 minutes, Arizona made defensive stop after stop. In that critical sequence, the top-ranked Wildcats held Stanford scoreless and helped preserve their perfect start to the season. This confident, unbeaten group believes it should be doing that all game long. For Arizona, three straight defensive stops is called a "kill." Nick Johnson kept Arizona’s unblemished record going for another game, hitting a go-ahead 3-pointer with 51 seconds remaining and two free throws with 5.8 seconds left as Arizona survived for a 60-57 victory Wednesday night for its school-record 21st straight win. "We’re an outstanding defensive team. It isn’t as if we changed any scheme, we just buckled down and had a lot of players playing very hard, and our ability to hold them to what we did is a big reason we won. Our defense won the game tonight," Arizona coach Sean Miller said. "No question we have to execute better on offense and we have to be more confident at the line." Johnson finished with 16 points, five rebounds and four assists and T.J. McConnell added 11 points, eight rebounds and four assists for Arizona (21-0, 8-0 Pac-12), off to the program’s best start in conference play in more than a decade. Arizona is one of three unbeaten teams left in Division I, joining No. 2 Syracuse, which also won Wednesday night. Fourth-ranked Wichita State hasn’t lost either. Powell and Josh Huestis each scored 13 points for Stanford (13-7, 4-4), which outshot Arizona 38 percent to 36 percent. "For 38 minutes, I thought we were right there," Stanford coach Johnny Dawkins said. "Credit Arizona for making the plays they had to make at the end. Nick Johnson stepping up, whether at the foul line or whether it was a 3-point bucket late. I’ve watched a lot of tape of them, he’s done it all year." Johnson missed a free throw with 28 seconds left and Stanford called timeout. Huestis missed a 3 from the left wing and Aaron Gordon secured the rebound, but he also missed a free throw giving the Cardinal one final shot. Chasson Randle missed a long 3 just before the final buzzer for Stanford. fter a 3-pointer by Huestis with 10:03 remaining, Stanford didn’t score again until Powell’s layin at 1:21 — and Powell missed two free throws at 4:36 that would have put his team ahead. "That’s what we should have done the whole game. We came out a little lackadaisical and after that we turned it up when the sense of urgency turned up, and after that we kind of locked down," Gordon said. "It was good to come on the road and get a win, regardless of whether we won by 20 or we won by three like we did." Arizona, ranked No. 1 for a school-record eighth consecutive week, overcame a slow start on the way to an eighth straight win against Stanford. The Cardinal beat two Top 25 teams already with victories at then-No. 10 Connecticut and at then-No. 17 Oregon earlier this month. But not this time given their struggles in the waning moments at Maples Pavilion, which hosted a No. 1 men’s team for the first time since losing 72-69 to Arizona on March 1, 2003. The Wildcats had a large contingent of fans in the crowd cheering "U of A! U of A!" Anthony Brown beat the halftime buzzer with a basket to put Stanford ahead 31-30. Arizona had trailed at halftime several times already this season only to produce a big second half. Arizona is on such a roll the players expect to win, even when they might not be at their best in a hostile environment. "One of the things we need to do is play defense at a high level more consistently and I think that will help us out a lot," forward Brandon Ashley said. "When we were down, we weren’t thinking about being down. For any team to be competitive, at any level, you have to be confident in yourself." Stanford’s last home win against a No. 1 team came against Arizona, 82-74, on Feb. 4, 1988.